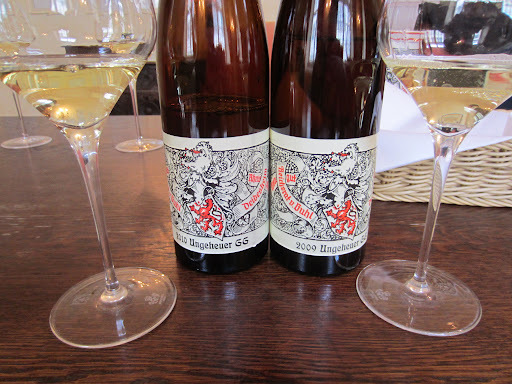 The Pechstein Riesling Sekt I tried, along with the Spatburgunder 2009 were both good wines, but weren’t outstanding examples, just good for the variety and style. Floral, ripe and earthy on the nose, and was the most elegant and linear I had tasted from the vineyard and vintage. Looking very quiet at the moment, much softer and less intense but richer and riper on the palate. Very tight, lean and concentrated, expressing more tropicality and minerality. Showing its age nicely with kerosene oily aromas and textures, coupled with vibrant fruit of dried peach and lemon curds. I was surprised that I could detect a difference in the residual sugar between the two vintages, which was only one gram more for the 2010 to balance the acids. A very smoky mineralic nose, rich stone fruits on the palate and a very concentrated yet clean and pure finish.